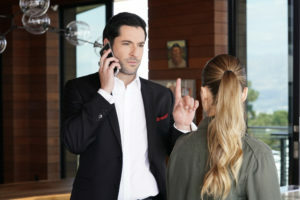 Lucifer is still not bothering to tell Detective Chloe Decker how he really feels about her. Instead, he seems to reason that since Lieutenant Marcus Pierce/Cain is out of the way, things can go back to the way they were before he ever showed up: getting back to normal, as it were. To Lucifer, this also means playing his “greatest hits” with Chloe including but not limited to juggling priceless baseballs (instead of breast implants as previously done), smoking weed at a crime scene, playing piano, and playing a rousing game of Monopoly with Chloe and her daughter Trixie. In fact, after trying to replay the exact same game of Monopoly as before, Trixie calls a halt to the game, wisely pointing out that playing the same game as before is boring and heads off to finish her book report. Smart cookie! This leaves Lucifer a little shocked and surprised and grasping at straws to the point that Chloe kicks him out. You’re probably not confused as to why, but Lucifer certainly was even though Chloe admitting that they can’t go back to normal right now because it hurts may have given him a clue. So Lucifer basically walks away from our case of the week giving Chloe some space. Well, that’s not entirely true but I’ll pick back up on that in a bit. For our case of the week we have the dead wife, Devin Clay, found shot at home with her husband, the big-time sports celeb, Forrest Clay, claiming it was a home invasion. This account of the incident is later called into question and Forrest admits he wasn’t even home at the time it happened as he was with his mistress, Mia. 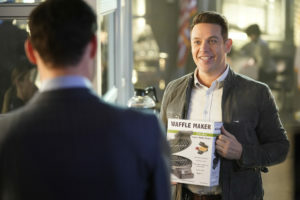 Charlotte Richards is actually familiar with this guy in two ways: he’s in her hell loop, her nightmares and she worked for a firm that represented him. As it turns out when Charlotte was a new, fresh-faced, and hungry attorney she was given a duffel bag from her boss and was told to incinerate it. The duffel bag in question had dried blood and was from Forrest Clay and she followed orders despite knowing better, but this leads Charlotte to think Forrest is guilty of murder. In order to get proof, Charlotte teams up with Amenadiel who walks into her old firm for a consult about his misdiagnosed chlamydia. When Charlotte shows up and causing a scene as a distraction by genuinely preaching about actions having consequences, Amenadiel is free to gain access to a company computer and download some files. Go, team take two! The files indicate there have been several non-disclosure agreements and payoffs to multiple women over the years and one of the names on the list is a woman who was murdered the same day that Charlotte got that duffel bag. While Forrest didn’t actually kill his wife, his case was connected to the aforementioned murder as the guy who went to prison for that murder recently got out of prison, went to kill Forrest but killed his wife instead. Charlotte is beyond frustrated that the police can’t put away Forrest for the first murder but Chloe has a plan. A trap is set for Forrest involving a big bluff by Charlotte about still having the duffel bag. In the end, he confesses and Chloe gets her man. While all of this is transpiring, Lucifer comes to the obvious realization that Chloe is a very capable detective who doesn’t actually need him around but likes having him around. 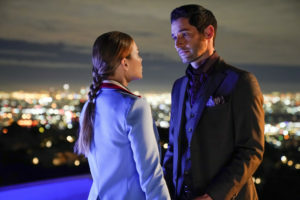 The two have their big moment where Lucifer confesses that he was worried Chloe only liked the parts of him she saw and if he showed her who he truly was, she would run. Once again he admits to being the Devil and goes on about how monstrous side In the “awwww” moment we’ve been waiting for, Chloe replies that he’s not the Devil: not to her. And they kiss. This would have been a wonderful moment had it not been for the interrupting phone call. Charlotte was celebrating her tiny victory with Amenadiel at a beautiful and peaceful spot overlooking the city: She’d helped stop a serial abuser and was feeling pretty good about herself, especially because Amenadiel pointed out that she didn’t do it for herself. When she hears something in the bushes Charlotte instinctually gets in front of Amenadiel, subsequently taking two bullets to the gut. Charlotte saved Amenadiel’s life but she couldn’t cheat death a second time and died in arms. In another shocking twist, Amenadiel’s wings return as good as new and he takes Charlotte up to Heaven where she belongs. We are left with a heartbroken Chloe, an extremely bereft Dan, and Lucifer who spotted a feather from his brother’s wings. So, who is responsible for killing Charlotte? That would be Pierce/Cain. He’s got a new plan, which is basically the old plan but with a new victim: He wants to kill Amenadiel – because surely killing God’s favorite son will give him his mark back – and then frame Lucifer for murder. Initially, Maze agrees to the plan in lieu of killing Pierce/Cain, herself, by emotionally baiting him. Crying, she goes on about how she’s messed everything up and has no one left. She’s not exactly wrong but Amenadiel offers kind words with a kicker of, “For what it’s worth, I will always be here for you.” and, just like that, Maze bails on the plan. This leads to a massive and very physical fight between her and Pierce/Cain when he calls her soft and accuses her of wanting to protect Amenadiel. Just when Maze has the upper hand, Pierce/Cain levels a threat against Dr. Linda. In a moment of doubt, Maze lets her guard down allowing Pierce/Cain to inject her with the sedative meant for Amenadiel and she passes out with pure murder in her heart. Pierce/Cain decides to take matters into his own hands and goes after Amenadiel whilst in the bushes of that overlook. What Pierce/Cain didn’t anticipate was Charlotte getting in the way and instead, he killed the wrong person. I think it’s time for him to go, one way or another. In all honesty, I didn’t expect to be as affected as I was by Charlotte’s death but seeing her lifeless body with Dan’s waffle bracelet on her wrist complete with her coming full circle as a human got me in all the messy feels. Amenadiel came to realize that angels and humans aren’t so different given the similarities between himself and Charlotte. I’m going to miss their friendship. Is it possible angels are like humans and they are responsible for their own fate? Is Amenadiel responsible for his loss and regaining his wings or was he called home for helping Charlotte? Something to take away from tonight’s episode, regardless: celebrate the little victories.